I am not buying a poinsettia this year. I am not buying a poinsettia this year. Been there, done that. I'm more into the Christmas Rose as a potted plant for the holidays. I am not buying a poinsettia this year. As soon as I bring them home, they start to drop their leaves. I think they put those foil pot wrappers on the pots of poinsettias to hide the bare stems which show after all the leaves start to drop. I am not buying a poinsettia this year. All those spray painted, glittered up, tarted up poinsettias in blues and purples seem oh so wrong to me. I usually rush by the displays of poinsettias in the big box stores. I am not buying a poinsettia this year. I'm not afraid to admit I actually have a fake poinsettia plant, complete with a container wrapped in foil, I bought it on clearance years ago. From a distance, it looks like the real thing and I'll set it out if I want to have a poinsettia on the hearth for Christmas. It's an easy plant to fake, I think. Hey, is that variegated foliage? I bought a poinsettia this year. Who can resist that variegated foliage? What makes it more unusual to me is that the bracts, the specialized leaves that give the poinsettias their color, are not variegated. I bought a poinsettia this year. I'm going to keep it watered and growing inside and then put it outside in the spring after all danger of frost and see how it does as a summer foliage plant. I bought a poinsettia this year. Curiously enough, this was the only variegated leaf poinsettia in the entire display. If it had been a toy, I guess it would have been banished to the Island of Misfit toys with the likes of Charlie in the Box. I bought a poinsettia this year. It doesn't have a foil pot liner so it looks a tiny bit bare around the base but who cares? No one is going to look at the bare stems with leaves like those. I bought a poinsettia this year. I have had this same conversation with self many times about many plants. The plants always win this argument. 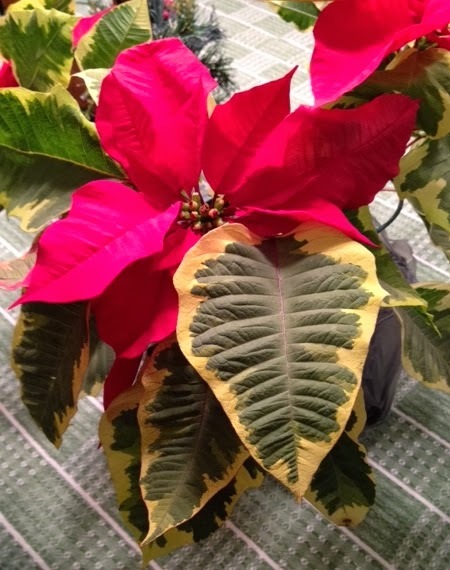 A handsome variegated leaf can seduce even the most resolute poinsettia hater. It's a wonderful combination of variegated leaf and clear red bract. I would have bought it too. We're weak. It's always a dilemma ! To soothe my troubled breast, I have started trying to think of them as cut flowers. Something to enjoy for a limited time before it inevitably DIES ! Once I started to view them as transient, I could enjoy them, without worrying about how to keep them alive !